Critically but sympathetically interrogating Italian philosopher Giorgio Agamben's analysis of the logic of sovereign power, this volume draws attention to the multiple zones of exclusion in and through which contemporary international politics constitutes itself. Beginning from the margins and peripheries of world politics, this book emphasises the colonial processes through which contemporary "third world" spaces of exception have been shaped and particular bodies made susceptible to the conditions of "bare life". The authors contend that these bodies inhabit a variety of spaces or "zones of indistinction" that include political detainees, refugees, asylum-seekers, poor migrants, sweatshop workers, and unassimilated indigenous populations. These are the "expendable bodies" that the territorial and market-driven logic of current international relations simultaneously produces, polices and excludes. Focussing on the locally and socio-historically specific ways that sovereign power works, the individual chapters provide the volume with a wide geographical reach. 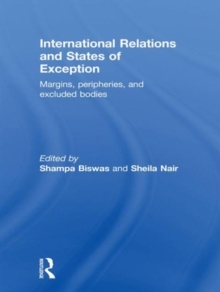 Drawing on diverse approaches, this text constitutes an important intervention in critical international relations, providing grounded theory and sophisticated analyses of how contemporary international relations works through the production of `exceptions'. Bringing together a range of internationally-renowned scholars, International Relations and States of Exception will be of vital interest to students and scholars of International Relations, Critical Theory and Postcolonial Studies.